Witnesses of the passage of time, vestiges of the force and the power of kings and armies and sources of myths and legends. Castles are unique and charismatic buildings of the surrounding landscape and of the towns to which they belong. In Mallorca there are five castles. Some are more accessible and in good condition. Others preside mountains in semi-ruin. At Mallorca Markets and Festivals describe what these magical places are. Bellver Castle is the most famous castle of Mallorca and one of the most peculiar of all Europe. It stands out for its circular plant. It is the only castle of this kind in Spain and one of the four that can be found in Europe, being this one the best conserved. Bellver Castle is one of the symbols of the city of Palma and can be seen with the naked eye from almost anywhere in the bay. Bellver Castle has its origins in the XIV century and its style is the Catalan Gothic. Historically, the castle began to be of residential use for kings and viceroys, but over the centuries it has been used many times as a military prison. It currently houses the Museum of History of the City of Palma and is one of the bigger tourist attractions of the city. Its views from the terrace allow a breathtaking view of the bay of Palma and also the Serra de Tramuntana and Pla de Mallorca. However, the name of Bellver comes from the expression of the ancient Catalan "bell veer" and means “beautiful sight”. It is one of the three rocky castles of Mallorca. Located in the Serra de Tramuntana, at more than 800 meters high, Alaró Castle was an impregnable fortress. Its origins are unknown, but there are records of its existence at the time of the Muslim invasion in 902 AD. Its location made it a stronghold of resistance from both the Saracen troops before the King In Jaume and the loyals of King Jaume II before the conquest of Alfons III d’Aragó. In 1622 an oratory was built and the castle was losing military importance to become only of religious place in the middle of the s. XVIII. At the moment, Alaró castle conserves its wall with five towers and the oratory, that was extended to chapel. The ascent to the castle of Alaró is a beautiful way and from its enclosure you can appreciate magnificent views of the Serra de Tramuntana and Pla de Mallorca. Another rocky castle, this one located to the south of the island, in the municipality of Felanitx, is the castle of Santueri. It is located about 400 meters high in the Serra de Llevant, and its impressive views were very useful to watch the coast in the presence of invaders. The castle stands out for its imposing stone walls built on the same cliffs, which made it an almost impregnable fortress. 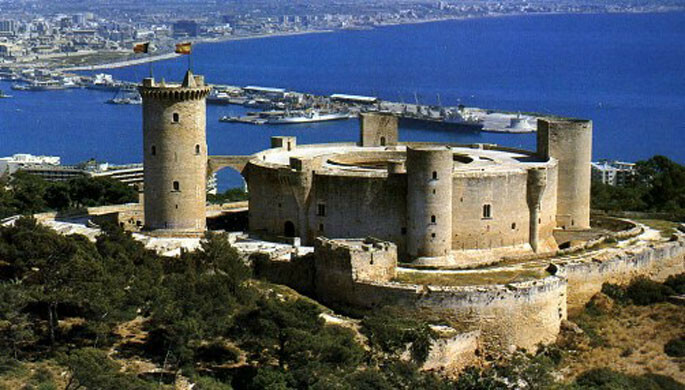 Proof of this is that the Catalan conquest succeeded in securing the castle, where Saracen troops took refuge, two years later than the rest of the island. Inside castle is semi-ruined, but it is still easy to imagine its strategic importance because the sights. Not surprisingly, it is believed that this settlement was already a defensive site of importance before the Roman conquest, although the current fortification dates from the fourteenth century. Visiting the castle costs 4 euros. The third rocky castle of Mallorca is in the north, in the valley of Ternelles, in the municipality of Pollença. It is almost 500 meters high and is also a fortification used by the Saracen troops to resist the invasion of the king En Jaume in Mallorca. The main function of this castle has been the watchtower defense, that is, giving notice to the people of the sighting of possible enemy ships. The Castell del Rei was abandoned in the 18th century and is practically demolished. Even so, the walls that stand on foot as well as the views over the north coast and the Tramuntana are impressive and worth a visit. To visit the Castell del Rei requires an authorization that must be managed in advance through the website of the Pollença town hall. The castle of Capdepera was the fortification in charge of watching the Menorca channel and on clear days you can see the neighboring island. The castle has a wall of almost triangular shape, four towers and inside it is a church. It was built by order of King Jaume II in the early 14th century around a Muslim defense tower and was a fortified city. Over the centuries and the decrease of pirate attacks, the town of Capdepera began to grow around the castle and it was abandoned. It is now part of the stage of the medieval market of Capdepera, one of the most popular thematic fairs in Mallorca. It can be visited throughout the year, the ticket price is around 3 euros and guided tours can be made with prior reservation.